The API for decryption tokens allows mass registration of patients by letter-printing companies, patient kiosk vendors and hospital IT departments. The faster an organisation registers patients the faster the return on investment. This API allows registering patients without needing face-to-face appointments. Instead the registration details for patients can go to each patient’s home using automatically generated letters from the institution’s existing database about the patient. The organisation creates a record for their patient as they normally do (eg via HL7 API or CSV manual upload). At scale this usually means the HL7 APIs with A28 / A31 messages. The organisation can immediately send data to populate the record, for example with laboratory test results and clinic appointments. Any user with decryption rights to this patient’s record can use the new PKB Rest API call to generate a patient-specific unique user id and decryption token for that record. For example a hospital can create a letter to send to the patient’s home with the ID and token. 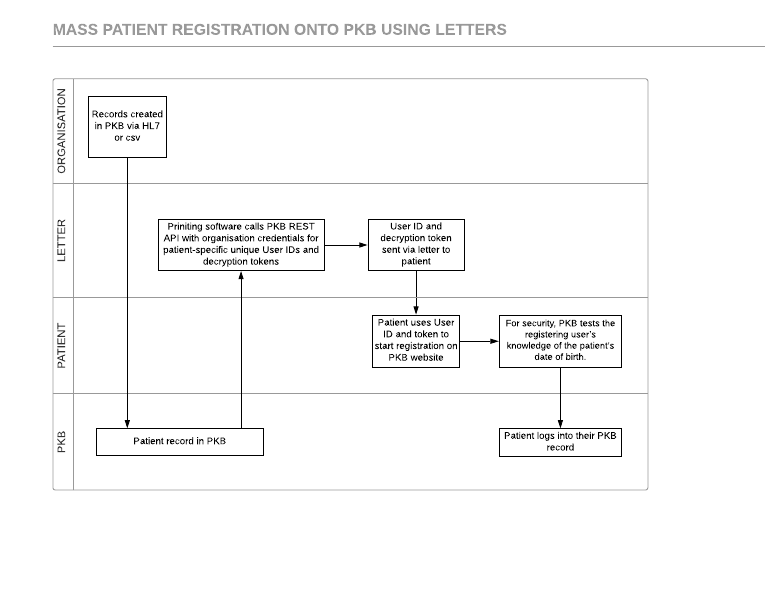 The recipient of the letter uses ID and token to start registration on the PKB web site. For security, PKB tests the registering user’s knowledge of the patient’s date of birth. The patient enters their email address and password. The patient can now log into the PKB web site to see their data and send messages to their clinical team. INVITED_NOT_REGISTERED - a record exists, an email address has been added and an invitation has been sent to that email address. Registration has not been completed. This does not recognise if a token has previously been generated to invite a patient. If a record already exists and was created in a different org a 401 response will be returned. Registration is performed against www.joinpkb.com parameters may be passed into this url for form pre-population if desired.